W-wa Jeziorki: Look at the snow LOOK AT THE SNOW! I was awakened by the sound of an avalanche coming down off the roof. This was not in the script!?! 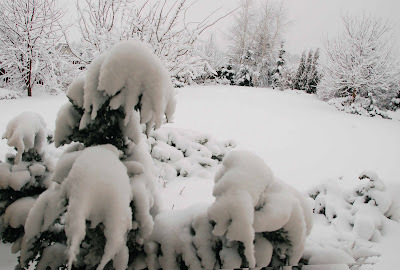 All right, it did snow and settle on 27 March last year, but the amount of overnight snow - plus the fact that a heavy fall was not predicted by the weather forecasters - surprised me. I grab the camera while Moni and Eddie grab the brooms. They've put their hats and gloves away for spring already! How previous! 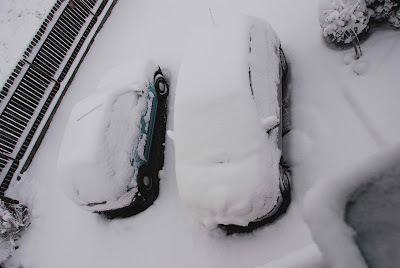 The Micra has just come back from extensive bodywork, so it's looking factory-new under that snow somewhere. It's not snowed like this all winter, and here we are, five days into spring. 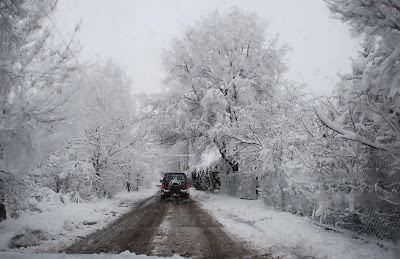 Look at how much snow is on the trees and powerlines. Fortunately, it's not that cold (only -2C). Michale I heard you today in Tok FM. Nice to hear you! Wow, I thought the snow we had in Kraków was bad! Photographing snow is a cow of a job! I don all the right things like setting exposure compensation to +2/3 or more but even then it's never 'quite' right! Made easier by Photoshop! Tweak the contrast, isolate the snow to brighten, increase colour saturation on the blue sky. I set exposure to +1/3rd of a stop.